First Chance Nepal arranged a candle making workshop at Khagendra for the festival of Tihar (the festival of light) in November 2015. The residents spent the day making candles from scratch using the candle moulds, melting wax and adding colours. It was an amazing day and all the residents got involved. The residents showed amazing focus and hard work resulting in them making over 500 candles which were used during the Tihar celebration at Khagendra. Following the success of the workshop First Chance Nepal has bought Khagendra it's own candle making equipment (moulds, wax and colours). This will enable residents to continue to make candles which can then be sold at local shops to potentially generate a small income. In Decemeber 2015 First Chance Nepal funded the repairs and bought one new solar panel for Khagendra. During winter in Nepal temperatures are often around 0 degrees. Khagendra had no supply of hot water for washing. This meant that residents were reluctant to wash regularly in these cold temperatures as it put them at risk of becoming unwell. However infrequent washing lead to poor hygiene within the centre, which increased risk of other illnesses. 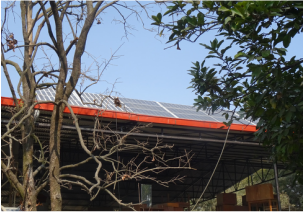 By fixing and providing an extra solar panel residents now have a reliable source of running warm water. First Chance Nepal hopes this will improve hygiene and quality of life to all the residents at Khagendra. In November/December 2015 First Chance Nepal arrange a clothes drive in Kathmandu. We were amazed and moved by the response and collected over 500 items from local Nepali people, monks and tourists. Many of the clothes donated were coats, warm socks and hats which were essential as temperatures were dropping and many of the residents at Khagendra and other local disabled homes didn't own any warm clothing. Joe Waite, Holly Barwick and Ellie Pygall (First Chance Nepal Staff) distributed the clothes at Khagendra, the Children's SOS Village and within the blind community Jorpati Kathmandu area. It was a brilliant day and so nice to see so many grateful, smiling, warm faces! 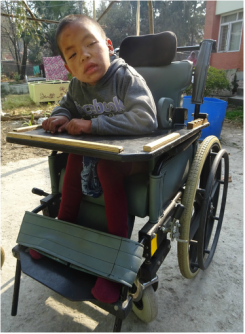 In September 2015 First Chance Nepal arranged for a local wheelchair technician to come to Khagendra to assessed and fix residents wheelchairs. First Chance Nepal funded new parts such as footplates and pressure cushions. First Chance Nepal are hoping to organise a basic wheelchair maintenance course so the residents can learn how to make general repairs on their own chairs and maintain them in the future. This is not only important for ensuring residents maintain the own independence but also to help maintain good postures and reduce the risks of skeletal deformity and muscle tightness. In December 2015 First Chance Nepal were lucky to link together with a group of people from Aussie Action Abroad. Aussie Action Abroad came to Khagendra for the day and helped Joe and Holly clear and paint the physiotherapy room making. This made the room fully accessible and a much nicer environment for physiotherapy. ​Aussie Action Abroad also helped clear the garden at the back of Khagendra and weed the small basketball hoop area so the residents could play basketball again. 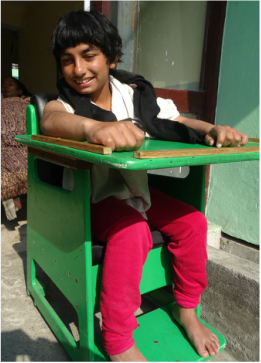 In December 2015 First Chance Nepal were able to arrange and fund for SERC (Special Education and Rehabilitation Centre) to build specialist postural seating for some of the younger residents at Khagendra. 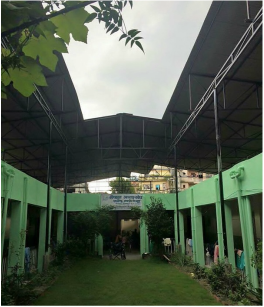 When First Chance Nepal first visited Khagendra in 2013 the roof was in a terrible state. It was leaking in many of the resident’s rooms and forming large pools in the corridors. Nepal has heavy rainfall during the monsoon season, which lead to the building became damp, cold and uncomfortable for the residents, many of which are unable to move independently. The damp conditions also meant the residents were at risk of many other medical complications including chest infections and pressure sores. ​First Chance Nepal were able to raise just over a whopping £10,400.00 which funded the building of a new roof over Khagendra Home. The roof was completed in July 2015 and means the residents of Khagendra are now able to live in a dry and comfortable home, with significantly less environmental risks to their health. In 2013 we were able to fund a Tilt Table for the centre and provide training to the staff and residents on how to use it safely. The tilt table is an invaluable piece of physiotherapy equipment. It allows patients who are unable to weight-bear through their lower limbs independently the chance to do so. This provides many physiological benefits such as: prolonged lower limb stretch to prevent contractures, an opportunity for strengthening, reduces the onset of osteoporosis, it aids digestions and multiple organ function and provides a change in position to maintain skin integrity.